Once during the semester, you will present a digital design from your journal to the class. You will spend a few minutes telling the class about the design, why you chose it, and how it connects to the class. After you show your design, you will lead a short discussion on the design. You will sign up for these presentations in advance, using the Scheduler in Canvas. How do I turn in my presentation? Go to the Presentation assignment in Canvas and either add the URL to the text you are analyzing OR embed the document in the composing area. Aim to share the information by noon on the day you present so that the details can be added to the post for the day. Does the design have to come from my journal? Yes, it should. However if you were particularly taken by someone else’s journal entry, you can ask that person for permission to use it. Does the design have to come from my most recent journal? No, it can be any journal entry you have done during the year. In the case where you find something that you want to present, but you haven’t written a journal on it, just make it the focus of your next journal entry. Do I need a slide show? No, these presentations are meant to be informal. You can have any notes that you like, but we will now show slides. Can I show the design as part of my presentation? Yes, absolutely. People won’t have the context to understand your comments if you do not show them the text. If it is video or audio, be mindful of its length. In the interest of time, you may need to play only part of the item. How do I lead class discussion? Remember that questions with simple or yes/no answers do not lead to conversation. Come prepared with a few questions that ask others in class to respond to or connect with the design you have shared. You can focus on the kinds of things that we talk about when we look at other texts in class. 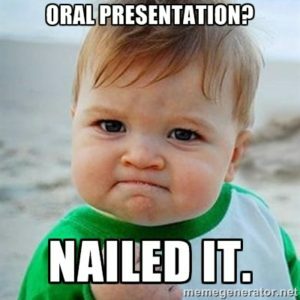 How are the presentations graded? Presentations are graded Pass/Fail for the presenter. If you participate as an audience member by joining the discussion, you can log your participation on the Class Discussion tab of your Participation Log. Can I have a sticker if I do a really, really good job? Possibly. If you are really, really good.